I subbed my Grasshopper’s class at a new club on Saturday – a gorgeous room with just enough sunlight and 38 bikes (all occupied!) and all with computers (cadence, watts, heart rate, even a trip meter). It was a treat – thanks, Nancy. I got good feedback on this new Top 40 mix from the riders in the class who pronounced it “tough.” I could tell from the puddles on the floor that they meant it. It includes 14 sprint intervals and about 25% of the time out of the saddle. It also includes four specific challenges: a long song for surging and climbing, two back-to-back combo climb/sprint drills, two back-to-back seated sprinting songs and back-to-back rolling hills. Each challenge is 6-7 minutes long. The Veldt [Radio Edit] (feat. Chris James) – Deadmau5 (2:50): Deadmau5 is a Canadian electro-house DJ and producer who wears a distinctive mouse-ear headdress at his gigs. According to Wikipedia, he was the first Canadian artist to headline a gig at Toronto’s Rogers Centre (20,000 strong). He also has a very interesting love life, having lived with Playmate Lindsey Evans and currently dating L.A. Ink’s Kat Von D. The Veldt is a luscious warm up song. I chose the Radio Edit but iTunes offers remixes as long as 11 minutes and everything in between. Finally Found You (feat. Sammy Adams) – Enrique Iglesias (3:41): We’re still warming up, but we’re going to add some tension, then pick up the pace and move into a tempo drill. Pick a tension and cadence you can maintain for the whole song and stay there. 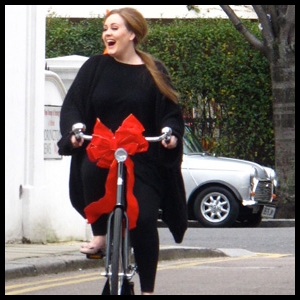 Rumour Has It (Joe’s Garage Mix) – Bump n Grind (6:02): Stole this great Adele remix from reader Di, who has an active health and fitness blog at www.workoutwithdi.com. (Thanks, Di!) This is the first of the four challenges. We’re going to alternate between a minute of surging (not-quite-sprints, seated, 80% of your max) and a minute of out-of-the-saddle climbing. Six minutes means three sets. Go! Levels – Avicii (3:20): Swedish DJ Avicii wrote this catchy (mostly) instrumental tune that I can’t get out of my head. Take the resistance up to 6/10 for some jumps: one minute each at 8 counts, 4 counts and 2 counts. Don’t Wake Me Up – Chris Brown (3:42): I had real issues over using Brown’s music after the domestic violence incident with Rihanna, but they are apparently on good terms again and he’s so damn talented. Kudos to regular contributor Spindarella, who discovered it. This song begins the second challenge. We’re going to climb out of the saddle for the verses and do standing sprints for the choruses. There are three short sprint intervals of 23/30/23 at 1:07-1:30, 2:22-2:52 and 3:07-3:30. Amnesia (Radio Edit) – Ian Carey and Rosette (3:08): Let’s continue with the latter half of the second challenge, climbing out of the saddle for the verses and standing sprints for the choruses. Three sprints 30/15/15 at 0:33-1:03, 1:33-1:48 and 2:18-2:32. Carey is a Miami house DJ and veritable old-timer in the business (he’s 37). As with The Veldt, I chose the radio edit but there are a number of different remixes available on iTunes. Somebody That I Used to Know (Tiesto Remix) (feat. Kimbra) – Gotye (4:33): I always try to include one track in my classes where riders can close their eyes, zone out, and let it be just them and the bike. Gotye’s haunting hit is that track today. A simple out-of-the-saddle climb here. I minimize my talking, usually only noting the halfway point. Riders who need it can take some extra recovery time before the third challenge. Everybody Talks – Neon Trees (2:57): What are alt-rockers Neon Trees doing in a playlist full of house music? I dunno – I just liked the energy of this song. Third challenge starts here: seated sprint intervals for the choruses with recovery during the verses. The sprints here are 22/20/45 seconds long at 0:30-0:52, 1:12-1:32 and 2:09-2:55. Red – Taylor Swift (3:43): Country now? Have I taken leave of my senses? Perhaps, perhaps, but I am very curious to hear the rest of Swift’s next album – it drops on October 22. If all the songs are as strong as Red and We Are Never Getting Back Together, I predict it will be her biggest yet. Let’s finish the third challenge: two sprint intervals: 30 seconds and a gruelling 1:45 at 0:38-1:08 and 1:40-3:27. Hey, I did say it would be a challenge. Give Your Heart a Break – Demi Lovato (3:25): After that whale of a sprint, we need some extra recovery, so take the first 38 seconds of this song to wipe your brow and swig some water. More jumps coming up, simple 4 count throughout at medium-high tension (7/10 or thereabouts). Lovato is back in the saddle as a judge on The X Factor after a very public breakdown in 2010 – I’m predicting it will do great things for her career, as it did for Adam Levine on The Voice. Kiss You Inside Out – Hedley (3:37): This is the latest single from these Canadian rockers. It’s perfect for some single-leg drills. Begin with the right leg doing all the work; the left leg is still in the clip or cage for safety reasons, but it’s just along for the ride. Coach nice smooth circles, pushing down on the downstroke, scraping across the bottom as if scraping mud from your shoe, and pulling up on the upstroke. After 30 seconds, switch to the other leg. You want enough resistance on the bike that you can keep up with the music and complete 30 seconds with good form, but you’re mighty happy to hear it’s time to switch legs. I Cry – Flo Rida (3:44): Fourth challenge starts here – back-to-back rolling hills. We’re going to be out of the saddle for the full 7 minutes. Start with enough resistance to support your weight then cue small increases (up/up/down/down, or up/down or even up/up/up/down/down/down). The challenge is in maintaining the cadence as the resistance increases. Die Young – Ke$ha (3:33): Despite criticism that when you’ve heard one Ke$ha song, you’ve heard them all, her latest is getting a ton of airplay where I live and is already in the top 10 in Canada and Australia. Let’s finish the fourth challenge with more rolling hills. 50 Ways to Say Goodbye – Train (4:08): I like a big Las Vegas finish for my classes and this summer 2012 release from Train fits the bill perfectly. Just try not to sprint for the choruses! We have three more intervals between us and the showers, so give your shoulders a roll, grab some water and hit it: 30/42/1:00 at 0:45-1:12, 1:56-2:38 and 2:58-3:55. I’m gonna do mine standing. Whoops optional. Hall of Fame (feat. will.i.am) – The Script (3:23): Inspiring lyrics from these Dublin rockers I’d never heard of before last week, though this song debuted at #1 in Ireland and has also hit #1 in Scotland and the UK. It hasn’t quite had the same success in North America but it was only released less than 8 weeks ago. If you haven’t heard this one on the radio yet – you will. Cool down. We Are Never Ever Getting Back Together – Taylor Swift (3:12): I didn’t want to like it. The title has the whiff of a working title where nothing catchier ever came to her. Swift allegedly wrote the whole thing in 30 minutes. But it got into my head, and I can’t stop humming it. I’m not the only one – in two months, it’s gone to #1 in Canada, the USA and New Zealand. If you’d rather something a bit peppier, The Radio City Deejays have a catchy dance mix (the Compagna Dance Mix) that comes in slightly longer at 4:44. I shortened this ride to 45 minutes for the class I subbed today (at another gym in a different part of town) and was chagrined to realize I had one rider who’d been at the gym on the weekend where I initially used this playlist. He was very gracious about getting almost the same ride and commented that the extra 15 minutes really felt tougher. To shorten the ride, I left out Finally Found You and used the first minute of Rumour Has It for warmup, plus I left out Everybody Talks and Red (the 3rd challenge), but you could also choose one seated sprinting song of the two, and one of the two songs for rolling hills. Your current report offers established useful to us. It’s really helpful and you really are certainly really well-informed in this region. topic along with intriguing and reliable articles. Excellent mix! All my favorite songs are in it. This worked great!! Thanks so much! Thanks for another great mix! As for the repeat attender, I think it is a good sign that he *noticed* you used the same stuff on him. You must have done a great job of bringing him into the moment of the first time if he was able to recognize he was back in the same one again later! Well it was only 48 hours later! I do find I tend to notice and care about the music more than my riders. I have a terrible fear of overusing the same playlist because when I was first taking classes and before I was teaching myself, there was one instructor who rotated the same four CDs for months. I knew every song, in order, and it was killing me, but the time slot really worked with my schedule so I suffered silently and when I started teaching I promised myself I would never do that to people. Another great mix…and 60 minutes is just right! Thanks Steve! I had to shorten it for a 45 minute lunch class but I liked it better at 60, too. (In fact, my gym used to do 75 minute Sat/Sun morning classes and I loved subbing those. Thanks Ted! I’ll drop you a note. Would you be interested in posting a playlist or two of yours to the Reader Playlist page? Love, Love, Love your playlist!! They have made my spin classes so much more exciting and helped me get out of the same old same old! Thanks for your time in sharing with us all! awww thanks for the shout out! Love that Adele remix! All about the remixes! I am so glad you enjoyed it. Your playlist is really awesome. You know how to pick em… Thanks again for subbing my classes.